GANGNEUNG, South Korea: Propaganda leaflets from North Korea marking the start of the 2018 Winter Olympics have been found in mountains in the South Korean capital, Seoul, a North Korea specialist news website reported on Monday. The fliers, which are presumed to have been dropped from balloons flown from North Korea, show the 2018 Pyeongchang Olympics logo and its two cartoon mascots standing beneath the Olympic rings, according to photos of the propaganda leaflets published by the NK News website. "Welcome, guests from Pyongyang!" the flier reads, referring to the delegation of North Koreans travelling to the Games, which begin on Friday. The North Korean delegation includes 12 ice hockey players who have formed a joint squad with the South Korean women's national team. North Korea's ceremonial leader Kim Yong Nam will make an unprecedented visit to South Korea this week, officials said on Monday, as hopes grow for high-level inter-Korean talks during the Olympics. The leaflets, which NK News said were found on Saturday, also welcomed the "North Korean athletes, cheerleaders, journalists, Taekwondo display team, and performance artists". 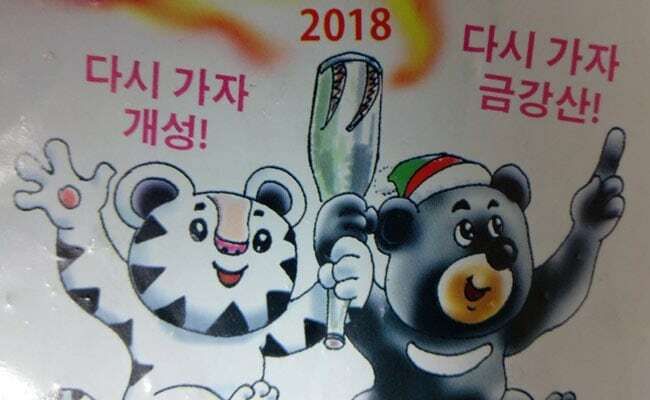 The reverse side of the propaganda leaflets showed the Winter Olympics mascots striding side-by-side and saying "Let's go to Kaesong! Let's go to Mount Kumgang! ", referring to the closed inter-Korean industrial zone and a failed inter-Korean tourist project that sit just inside North Korea. Kaesong was closed by South Korea in 2016 in protest over North Korea's nuclear and missile programmes. The inter-Korean Mount Kumgang resort in the coastal province of Kangwon closed after a South Korean tourist was shot by a North Korean guard in 2008. North Korea announced last month a new "world-level" tourist project in the divided province that appeared to be aimed at capitalising on the international attention surrounding the Winter Olympics in Pyeongchang, a city in the South Korean-controlled half of Kangwon. Activists based in South Korea regularly use balloons to send fliers, money and foreign news across the demilitarised zone into North Korea. In response, Pyongyang has also used balloons to send its own anti-South Korean fliers towards Seoul, where the colourful and tattered leaflets can sometimes be found in mountains or scattered in public places.